You can use Behat to describe anything that you can describe in business logic. Tools, GUI applications, web applications, etc. The most interesting part is web applications. First, behavior-driven testing already exists in the web world - it’s called functional or acceptance testing. Almost all popular frameworks and languages provide functional testing tools. Today we’ll talk about how to use Behat for functional testing of web applications. One of the most important parts in the web is a browser. A browser is the window through which web application users interact with the application and other users. Given I am on "/index.php"
You’ll need something to simulate browser application. Scenario steps would simulate a user and the browser emulator would simulate a browser with which the user interacts in order to talk to the web application. Headless browser emulators - browser emulators that can be executed fully without GUI through console. Such emulators can do HTTP requests and emulate browser applications on a high level (HTTP stack), but on a lower level (JS, CSS) they are totally limited. They are much faster than real browsers, because you don’t need to parse CSS or execute JS in order to open pages or click links with them. In-browser emulators - this type of emulator works with real browsers, taking full control of them and using them as zombies for its testing needs. This way, you’ll have a standard, fully-configured, real browser, which you will be able to control. CSS styling, JS and AJAX execution - all supported out of the box. The problem is we need both these emulator types in order to do successful functional testing. Both these tools are quite limited at some tasks, but succeed at others. For example, you can’t use in-browser emulators for all tests in your application, because this makes your tests become very slow. Also, you can’t do AJAX with a headless browser. When I go to "/news.php"
And this step should be somehow executed through one or another browser emulator at will. Here comes Mink. Mink is a browser emulator abstraction layer. It hides emulator differences behind a single, consistent API. Support for both in-browser and headless browser emulators. Mink is a PHP 5.3+ library that you’ll use inside your test and feature suites. 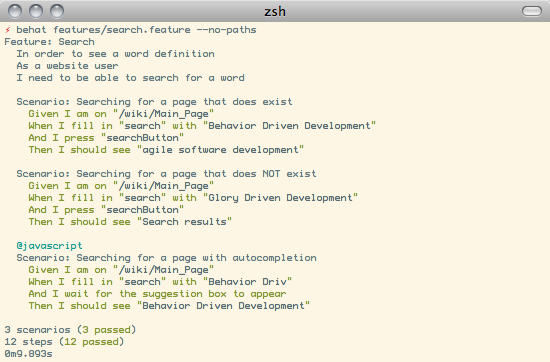 Before you begin, ensure that you have at least PHP 5.3.1 installed. Mink integration into Behat happens thanks to MinkExtension. The extension takes care of all configuration and initialization of the Mink, leaving only the fun parts to you. Mink should be installed through Composer. Note that we also installed two Mink drivers - goutte and selenium2. That’s because by default, Composer installation of Mink doesn’t include any driver - you should choose what to use by yourself. The easiest way to get started is to go with goutte and selenium2 drivers, but note that there’s bunch of other drivers available for Mink - read about them in Mink documentation. And this executable will already autoload all the needed classes in order to activate MinkExtension through behat.yml in the project root. It should show you all the predefined web steps as MinkExtension will automatically use the bundled MinkContext if no user-defined context class is found. MinkExtension comes bundled with MinkContext, which will be used automatically by Behat as main context class if no user-defined context class found. That’s why behat -dl shows you step definitions even when you haven’t created a custom FeatureContext class or even a features folder. 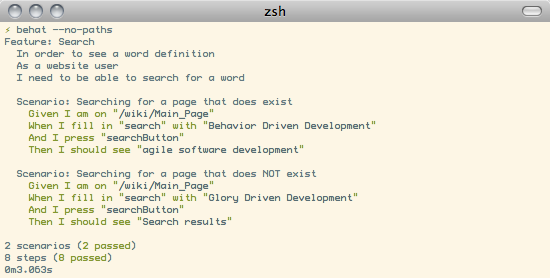 When I fill in "search" with "Behavior Driven Development"
Then I should see "agile software development"
When I fill in "search" with "Glory Driven Development"
Then I should see "Search results"
Searching for a page that does exist - describes how Wikipedia searches for pages that do exist in Wikipedia’s index. Searching for a page that does NOT exist - describes how Wikipedia searches for pages that do not exist in Wikipedia’s index. Selenium2 gives you the ability to take full control of a real browser with a clean consistent proxy API. And Mink uses this API extensively in order to use the same Mink API and steps to do real actions in a real browser. Then I should see "Behavior Driven Development"
That’s because you have used custom Then I wait for the suggestion box to appear step, but have not defined it yet. In order to do that, we will need to create our own FeatureContext class (at last). 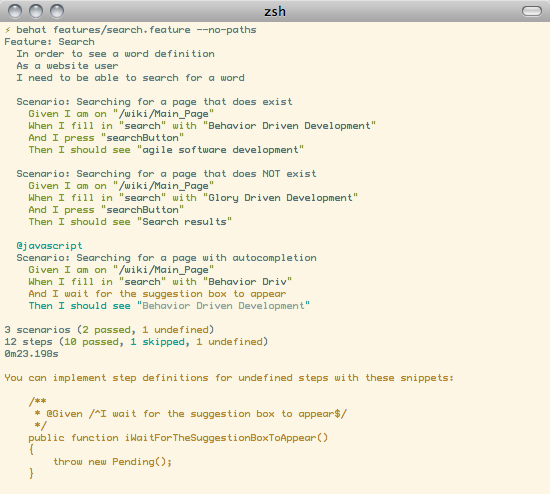 This command will create features/bootstrap folder and features/bootstrap/FeatureContext.php class for you. Oh... Now Behat tells us that all steps are undefined. What’s happening there? As we’ve created our own context class, MinkExtension stopped using its own bundled context class as main context and Behat uses your very own FeatureContext instead, which of course doesn’t have those Mink steps yet. Let’s add them. There are multiple ways to bring the steps that are bundled with MinkExtension into your own context class. The simplest one is to use inheritance. Just extend your context from Behat\MinkExtension\Context\MinkContext instead of the base BehatContext. That simple. We get the current session and send a JS command to wait (sleep) for 5 seconds or until the expression in the second argument returns true. The second argument is a simple jQuery instruction. Context isolation is a very important thing in functional tests. But restarting the browser after each scenario could slow down your feature suite very much. So by default, Mink tries hard to reset your browser session without reloading it (cleans all domain cookies).